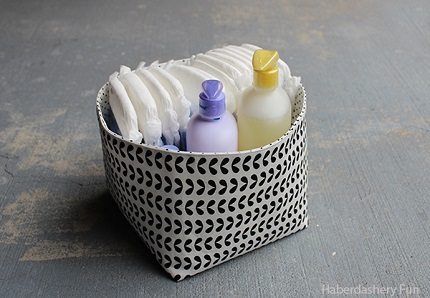 Marni from Haberdashery Fun shows how you can make these fun fabric storage baskets. They’re reversible so there are two possible looks for each basket. Plus, there aren’t any exposed seams showing on the inside of the basket. Use them in your bathroom to organize toiletries. Or use them in your craft room to corral your supplies. Or how about by the door to catch your keys? Or on your dresser to collect your eyeglasses or jewelry? I’m sure you can find plenty more uses for these pretty baskets. Go to Haberdashery Fun for the tutorial.